Beth Wightman has been elected the next Chair of the English Department. Please join us in congratulating her and in thanking Anthony Dawahare and Michael Bryson for their willingness to serve in this critical capacity. Beth will officially begin her new role in the fall. Meantime, Kent Baxter will continue to guide us through this period of transition. And a huge thanks to him for his exemplary leadership over the course of the last three and half years! We couldn’t have done it without him. Sharon Klein is retiring. (Drum roll? Fanfare? Say it isn’t true!) 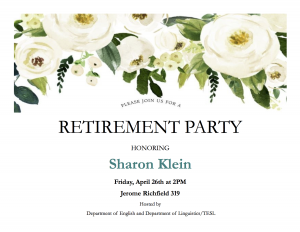 Please save the date and plan to come help honor her long and distinguished CSUN career, but not to say goodbye, for surely, we’ll be seeing her around! Hosted by English and Linguistics/TESL, the event will take place on Friday, April 26, at 2:00 p.m., in JR 319. To kick off National Poetry Month, the creative writing program is hosting local poets David St. John, Anna Journey, Angel Garcia, and Lynne Thompson, along with two alumni poets–Sophia Apodaca and Arthur Kayzakian–for a gala celebration and poetry reading. The event will take place on Thursday, April 4, at 7:30 p.m., in JR 319. Delicious refreshments will be served and all are invited! Also just in time for National Poetry Month, The Northridge Review is excited to announce the release of its all new, Spring 2019 issue–another stunning hand-made artifact of the English Department Book Arts Lab–at another gala celebration reading on Friday, April 5, at 7:00 p.m. in CSUN’s Bianchi Planetarium. The event will be preceded by an open mic at 6:30 p.m.–all are welcome! And there will be food. Captured, the annual journal of the Africana Studies Department, will also be hosting a launch party on Tuesday, April 23, from 5:00 p.m to 7:00 p.m. at The Black House, 18348 Halsted Street. The magazine is edited by Acquil Yorke, an English Department TA and creative writing graduate student, and it will feature a poem by Janice M. Robinson, who is also an English Department TA and a literature graduate student. Please save the date for an important College of Humanities Brown Bag meeting with Interim Dean Jackie Stallcup, Associate Dean Sheena Malhotra, and Director of Finance and Operations Janene White to discuss and plan together for upcoming budget scenarios. The event will take place on Tuesday, April 23, from 12:30 to 1:45, in JR 319. All faculty and staff are invited and encouraged to come help share their ideas and concerns. The Dean’s office is in the process of creating a collection of faculty publications from the College of Humanities. This library of faculty works will be catalogued, curated, and displayed in the Dean’s suite reception area. The collection will also be available for loan to students, staff, and faculty. Please direct a copy of anything that you would like to have included to Jim Lunsford, Analyst/Special Projects, College of Humanities, at MD 8252. You might want to check first, though, to see if they already have a specific copy, as a small collection already exists. The Academy of American Poets Prize Competition is now accepting submissions for the 2019 award. The winner will receive a cash prize from the Academy of American Poets and publication in the Northridge Review. One Honorable Mention will also be awarded. The AAP is also pleased to announce the Aliki Perroti and Seth Frank Most Promising Young Poet Award. Students 23 years-old or younger who have won the AAP prize will be considered for an additional $1000 award. To enter, students should submit one to three poems, accompanied by a cover sheet, to the English Department Office in ST 708. Poems may be any length or style. Names should not appear on the poems, but each submission should include a cover sheet with student’s name, address, phone number, email address, and the titles of the poems submitted. All work must be typed and submitted in duplicate for judging. Please encourage your students to apply for this prestigious honor. Faculty Development and the LRC are offering a series of workshops to support faculty in the development of clear and transparent assignments and more effective collaborations with the LRC Writing Center in order to help address student writing improvement across the disciplines and at all levels. A stipend for attendance will be provided! The workshops will take place on Wednesday afternoons, from 2:30 p.m. to 4:30 p.m. (April 3, 10, 17, 24), in the Learning Resource Center, Oviatt Library 3rd Floor, East Wing. For more information, please see Transparent Assignment Design Workshops. Please help us recognize 2018-2019 graduating Matadors who embody the CSUN “We Can Do This” spirit and demonstrate qualities of grit and persistence, through timely completion of degree, contributions to the CSUN community, and a commitment to Matador excellence in and beyond the classroom. Nominations will be reviewed by the Matador Momentum Selection Committee. Selected candidates will receive a certificate of honor, serve as the flag bearer for their college during the 2019 Commencement ceremony, and be featured on the Matadors Rising website for the upcoming academic year. The nomination form is short and sweets, so please submit your nominations through the following link: Matadors of Distinction Nomination Form no later than Monday, April 8. The CSUN office of Community Engagement is pleased to announce their annual round of funding for the Fall 2019 semester. They are offering five types of grants to support faculty in providing new service learning opportunities to students and in disseminating service learning knowledge, research or findings. Tenured, tenure-track, and lecturer faculty are eligible to apply. For more information, please see https://www.csun.edu/undergraduate-studies/community-engagement/grant-opportunities. The M.A. in Diverse Community Development Leadership (DCDL) is a proposed collaboration between the College of Humanities and Tseng College currently under consideration at the Graduate Studies Council. If approved, the program will be looking for an Academic Lead. Qualifications include: full-time tenured faculty member within the college, experience working with diverse communities, and administrative experience (preferred). If you are interested, please submit a short CV (2-3 pages) with relevant information included, and a short statement (approximately one page) regarding your interest in this position to Noreen Galvin at noreen.galvin@csun.edu by April 5. The WhatEvery1Says Project (WE1S) uses digital humanities methods to study public discourse about the humanities at large data scales. Based at University of California, Santa Barbara (UCSB), with core collaborators at California State University, Northridge and the University of Miami, WE1S expects to hire up to two CSUN faculty members and ten CSUN students to form the cohort for its second Summer Research Camp, which will take place from July 1 to August 2, 2019. The Summer Research Camp will focus on interpreting the project’s collected corpus of public discourse materials related to the humanities through the machine-learning method of topic-modeling. Appropriate training in digital humanities methods, tools and technologies, and the project’s collaborative methods are offered as part of the research camp. No prior technical experience is necessary, although participants should have an interest in acquiring knowledge of digital methods. For further information on eligibility and applications procedures, see the project’s 2019 CSUN Summer Research Camp Application page. More information about the project can be found at http://we1s.ucsb.edu/about. Scott Andrews chaired two panels and presented on a third at the annual Native American Literature Symposium in Minneapolis, MN, on March 7-9. He organized and chaired two panels on Cherokee culture, and he presented “The Semiotics of Kent Monkman’s Queer Frontier” on a panel discussing contemporary native art. Grad student Katie Wolf presented “Historical Trauma and Narrative in Louise Erdrich’s The Plague of Doves at the Native American Literature Symposium in Minneapolis on March 7 to 9. Audrey Thacker presented her paper, “Sorry to Bother You, but Welcome to Braggsville–and Now Get Out: In Underground/Underskin Racial Performance, Will the ‘Real’ Black Man Please Stand Up?” at the annual conference of MELUS (the Society for the Multi-Ethnic Literatures of the United States), in Cincinnati. Steven Wexler presented his paper, “Inferentialism or Reason as Performance: Comp Lessons from the Pittsburgh School,” at the 2019 Conference on College Composition and Communication in Pittsburgh.